Kidney disease frequently complicates malignancy and its treatment. The spectrum of disease in this setting includes acute renal failure (ARF), chronic renal failure, and tubular disorders. Fortunately, these complications are often preventable or reversible with prompt diagnosis and treatment. This review focuses on recent progress in the management of ARF and chronic renal failure associated with cancer and its treatment. Particular emphasis is placed on the following conditions: Uric acid nephropathy, gemcitabine-associated thrombotic microangiopathy, bisphosphonate-induced collapsing glomerulopathy, and hematopoietic cell transplant (HCT)-associated renal failure. The classic entities such as lymphomatous infiltration of the kidney and paraneoplastic glomerulopathies also are reviewed with a focus on recent developments. Renal failure in the cancer patient is often multifactorial, but it is still clinically useful to consider causes as prerenal, intrinsic, and postrenal (1,2) (Table 1). Not surprising, prerenal failure is common. The spectrum of intrinsic renal disease in this patient population is broad. Multiple myeloma-related renal failure is a particularly important cause of renal failure and ESRD. Roughly 20% of patients with myeloma have renal failure, and these patients have more advanced disease at diagnosis and shortened survival (3). Although it causes only 1% of all cancers, myeloma-related ESRD accounted for 58% of all malignancy-related cases between 1997 and 2001 (4). Common forms of renal failure in myeloma include (in decreasing order of frequency) cast nephropathy, amyloidosis, and light-chain nephropathy. Myeloma patients are additionally at risk for ARF associated with hypercalcemia and perhaps with radiocontrast (5). Postrenal causes of ARF in cancer patients are more common than in the general population and should always be considered. Obstruction may occur at any level of the urogenital tract (Table 1), and common obstructing tumors include those of the prostate, bladder, uterus, and uterine cervix (2). Obstructive uropathy remains a possibility even in the absence of hydronephrosis because encasement of the collecting system by retroperitoneal tumor or retroperitoneal fibrosis may prevent pelvi-ureteric dilation. Retroperitoneal fibrosis is uncommon and primarily idiopathic, but it can be associated with previous pelvic irradiation or malignancies such as lymphoma and a variety of solid tumors (6,7). Although many solid and hematologic cancers may involve the renal parenchyma, clinical sequelae are usually not prominent. Lymphomas and leukemias are the most common such cancers, with 6 to 60% incidence in patients with diffuse lymphoma at autopsy (8–10). Lymphomatous invasion of the kidneys may occasionally present with ARF, proteinuria, or hematuria, but the diagnosis is usually incidental. 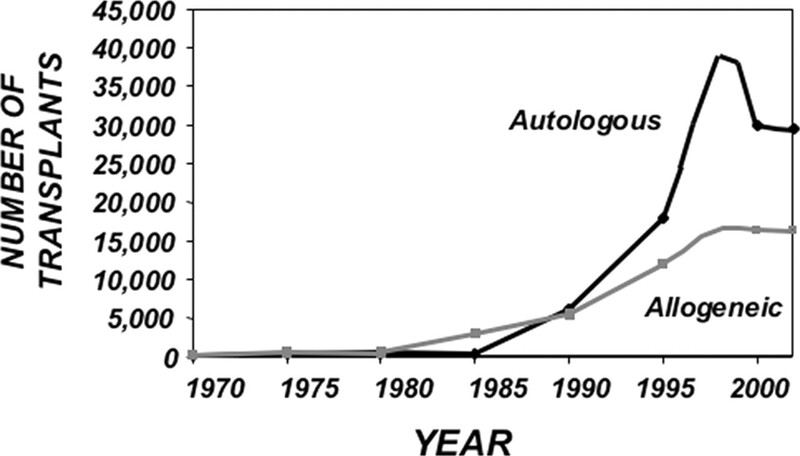 In one large autopsy series, only 0.5% of those with renal involvement had developed ARF (10). In only 10 of the 55 cases of renal lymphoma reported to date was the diagnosis suspected before biopsy (11). Renal imaging revealed bilateral enlargement in a majority of these cases. Prompt recognition of this syndrome is warranted because ARF associated with lymphomatous infiltration may respond well to therapy aimed at the underlying cancer (12). Resolution of ARF with anticancer therapy is the strongest evidence that lymphomatous infiltration of the kidney was the underlying cause (8). Metastatic extrarenal solid tumors only rarely cause ARF. Pulmonary carcinoma—followed by gastric and breast carcinomas—is the most common solid tumor to metastasize to kidney (13). Few cases of ARF resulting from solid tumor infiltration have been reported, usually with widespread parenchymal replacement (14). Tumor lysis syndrome describes the metabolic complications of either rapid tumor cell turnover or chemotherapy-induced tumor cell lysis. The syndrome is characterized by hyperuricemia, hyperphosphatemia, hypocalcemia, hyperkalemia, and ARF (15,16). Two forms of ARF are thought to occur but may coexist: ARF associated with large increases in plasma uric acid and with large increases in plasma phosphate. The pathophysiology of uric acid nephropathy includes intratubular precipitation of uric acid causing mechanical obstruction, direct toxicity to epithelial and endothelial cells, and potentially activation of the innate immune system (17–19). The pathophysiology of hyperphosphatemia-associated ARF is thought to involve intrarenal calcium phosphate precipitation and direct tubular toxicity of phosphate (20,21). Tumor lysis syndrome may arise with a variety of tumors but is most commonly associated with poorly differentiated lymphomas such as Burkitt’s or with leukemias, particularly acute lymphoblastic leukemia (22). Occasionally, patients will develop the syndrome spontaneously, but the majority of cases are associated with chemotherapy (23). Before the widespread adoption of prophylaxis, most cases of ARF in tumor lysis syndrome were due to uric acid nephropathy (24). Standard prophylaxis consists of oral or intravenous allopurinol to block uric acid formation coupled with intravenous hydration with or without urinary alkalinization. Urinary alkalinization has historically been recommended, but its use is controversial (25). The above regimen has dramatically reduced the incidence of uric acid nephropathy but not eliminated it. In a study of 41 patients who had acute leukemia and all received allopurinol prophylaxis before chemotherapy, 22 patients developed mild, two patients moderate, and one patient severe tumor lysis syndrome, although none required renal replacement therapy (26). Allopurinol has other limitations, including hypersensitivity reactions, drug interactions, dose adjustment in renal failure, and response time of several days. A rare complication of allopurinol therapy is xanthine nephropathy resulting from intratubular crystallization of xanthine. Inhibition of xanthine oxidase by allopurinol causes accumulation of xanthine (Figure 1) and hyperxanthinuria (27). Xanthine is threefold less soluble than uric acid in urine and has a higher pKa (7.4 for xanthine, 5.6 for uric acid), so intratubular precipitation is possible despite alkaline urine (27–29). Mechanisms of renal toxicity in tumor lysis syndrome. Chemoradiotherapy induces tumor cell lysis with release of intracellular constituents, including potassium, phosphate, and nucleic acids. Purine degradation creates xanthine, which is metabolized to uric acid and normally excreted by the kidney. In tumor lysis syndrome, very high levels of uric acid may accumulate, leading to intratubular crystallization and renal failure. Allopurinol blocks the metabolism of xanthine to uric acid, thereby preventing uric acid nephropathy, although rarely xanthine crystallization may occur instead as a result of poor solubility of xanthine in urine. Plasma expansion and alkaline urine inhibit crystal nephropathy. Intravenous administration of rasburicase results in rapid metabolism of uric acid to the more soluble allantoin, which is readily excreted by the kidney. Treatment of established tumor lysis syndrome consists of vigorous hydration and management of electrolyte abnormalities. Severe tumor lysis syndrome associated with ARF may respond well to aggressive intermittent hemodialysis or continuous renal replacement aimed at clearance of uric acid and phosphate; the ARF is generally reversible. A new approach toward the prophylaxis and treatment of uric acid nephropathy is the enzyme uricase, which catalyzes the oxidation of uric acid to the more water-soluble allantoin (Figure 1) (30). The Food and Drug Administration has recently approved rasburicase, a polyethylene glycol-modified recombinant uricase preparation, for the prevention of tumor lysis syndrome in pediatric patients. A nonrecombinant formulation of urate oxidase has been used in Europe since 1975 but has been associated with a 5% rate of allergic reactions (31). Rasburicase is effective and well tolerated with fewer allergic reactions. Goldman et al. (32) demonstrated reduced area under the curve over 96 h for uric acid in patients who were at risk for tumor lysis with 128 + 70 mg/dl in the Rasburicase group versus 329 + 129 mg/dl in the allopurinol group (P < 0.001). One patient in the allopurinol group required hemodialysis, but none in the rasburicase group did. In another study of 49 hyperuricemic adult patients, Rasburicase treatment for a median of 3 d resulted in a decrease in plasma uric acid levels from a median of 11.9 to 0.7 mg/dl (33). Coiffier et al. (34) followed 100 adult patients who had aggressive non-Hodgkin’s lymphoma and were given a prophylactic regimen of 0.2 mg/kg intravenous Rasburicase beginning the day before chemotherapy plus intravenous hydration. All patients achieved control of plasma uric acid within 4 h of injection, and none developed hyperuricemia throughout the observation period. No patient had an increase in plasma creatinine or required hemodialysis. Case reports have also suggested that Rasburicase therapy may be beneficial even after uric acid nephropathy and ARF have developed (35,36). Urate oxidase can dissolve precipitated uric acid crystals, so if it is filtered at the glomerulus, then it could reverse intratubular obstruction (35). Further studies are needed to clarify the role for Rasburicase in this setting. Rasburicase does not directly control plasma phosphorous levels in tumor lysis syndrome, and ARF in the setting of hyperphosphatemia and hypocalcemia has been reported (37). Although the overall frequency of glomerular disease in malignancy is low, paraneoplastic glomerular disease is well described (38–40). Published reports cite membranous nephropathy as the most common malignancy-associated glomerulopathy, occurring with many carcinomas and occasionally with leukemia and lymphoma, but this association has been questioned (41) and registry data do not consistently support it (42–44). Burstein et al. (45) reported the presence of an underlying cancer in nine (8.4%) of 107 patients with biopsy-proven membranous nephropathy, and in earlier reports, the incidence was similar, ranging from 5.8 to 10.6% (46,47). Because of this strong association, some suggest limited tumor screening in older patients who receive a diagnosis of idiopathic membranous nephropathy (44,45). The mechanism by which malignancy induces disease remains unproved but may involve deposition of tumor antigen in the subepithelial space with in situ immune complex formation and subsequent complement activation (48,49). Treatment of the underlying malignancy may lead to resolution of the nephrotic syndrome, lending indirect support to this theory (48,50). An association between minimal-change disease and Hodgkin’s disease is well established but uncommon, with an incidence of 0.4% among 1700 patients (40,41). There are also reports of membranoproliferative and rapidly progressive glomerulonephritis in the setting of malignancy (39). With regard to the association of antineutrophil cytoplasmic antibody (ANCA) vasculitis and malignancy, Pankhurst et al. (51) recently performed a retrospective case-control study comparing 200 consecutive patients with ANCA-associated vasculitis with age- and gender-matched control subjects. The authors found an increased risk for malignancy in those with vasculitis (relative risk 6.02), and one third of the patients received a diagnosis of malignancy concurrent with their renal diagnosis. They concluded that malignancy should be considered in the differential diagnosis of patients who present with ANCA vasculitis. A link between cyclophosphamide chemotherapy (particularly when given daily, orally) and bladder cancer is known, but this study confirms previous small series that suggested a direct link between ANCA vasculitis and cancer independent of therapy used to treat the vasculitis (52,53). The term thrombotic microangiopathy (TMA) describes a set of pathologic changes seen in a variety of clinical syndromes, including thrombotic thrombocytopenic purpura, hemolytic uremic syndrome, scleroderma, preeclampsia, antiphospholipid antibody syndrome, and radiation nephropathy (54,55). These pathologic characteristics include intrarenal or systemic microvascular thrombi with endothelial swelling and microvascular obstruction (54). For the purpose of this review, we use the term TMA syndromes to encompass the various clinical syndromes with these pathologic abnormalities. There is no consensus on diagnostic criteria required to diagnose a TMA syndrome, but laboratory features include microangiopathic hemolytic anemia and thrombocytopenia. Renal failure, neurologic abnormalities, and gastrointestinal symptoms are common (54,56,57). TMA syndromes are known to be a complication both of the tumor state itself and of certain treatment regimens (58). TMA has most commonly been associated with carcinomas. An early prospective study determined that 5.7% of patients with metastatic carcinoma have microangiopathic hemolytic anemia (59). Gastric carcinoma accounts for more than half of cases, followed by breast and lung carcinomas (60). Renal failure is an uncommon feature of cancer-associated TMA syndromes in the absence of chemotherapy. Antineoplastic drugs have been strongly associated with TMA syndromes. Mitomycin C is the prototypical agent, with a 2 to 10% risk that increases significantly after a cumulative dose of 40 mg/m2 (61–63). Bleomycin, cisplatin, and 5-fluorouracil have less frequently been associated. Gemcitabine is now a widely used nucleoside analog approved for treatment of pancreatic carcinoma and bladder and advanced non-small-cell lung cancers. In 2003, for example, worldwide sales of gemcitabine exceeded $1 billion (64). It has been implicated in the development of TMA (65,66) and we have recently reported the presentation and outcome of gemcitabine-associated TMA (67). The cumulative incidence was 0.31%, significantly higher than the previously reported estimate of 0.015% (65). Median time to diagnosis after initiation of gemcitabine was 8 mo with a cumulative dose ranging from 9 to 56 g/m2. In our series, new or exacerbated hypertension was a prominent feature in seven of nine patients with gemcitabine-associated TMA, and, most important, it preceded the TMA diagnosis in all cases. Hypertension has been associated with TMA syndromes, and, in some series, the severity of hypertension correlates with poorer outcome (61,68). The mechanism by which TMA induces hypertension is likely glomerular ischemia induced by microvascular capillary obstruction (69). Weekly visits to the infusion unit by patients who receive gemcitabine represent a chance to detect new or exacerbated hypertension as it develops. This could lead to earlier identification of gemcitabine-associated TMA and ARF (67). The bisphosphonates are antiresorptive agents that are widely prescribed to treat osteolytic metastases and hypercalcemia of malignancy. Pamidronate is proved to reduce skeletal complications in patients with either multiple myeloma or advanced breast cancer (70,71). Expanding indications for use in cancer patients warrant careful review of the renal toxicities associated with this medication class. Bisphosphonates are excreted unchanged by the kidneys, and elevation in plasma creatinine after infusion has been noted in animals and humans since this class of drugs was originally described (72). Second-generation bisphosphonates are more potent, and lower doses are used, which may partially explain their probable lower nephrotoxicity. Markowitz and colleagues (73,74) first reported seven patients who developed nephrotic syndrome while undergoing treatment with pamidronate. Histology revealed collapsing glomerulopathy (75). These patients were all HIV negative, and five of seven received pamidronate dosing at levels two to four times higher than recommended. Notably, the three patients in whom pamidronate was discontinued after diagnosis of nephrotic syndrome had subsequent improvements in plasma creatinine, whereas the four who continued to receive the drug progressed to ESRD that required renal replacement therapy. One patient was rechallenged with pamidronate after developing pamidronate-induced collapsing glomerulopathy. Although her proteinuria had improved off the drug, it worsened after rechallenge, providing further evidence for causality between pamidronate and collapsing glomerulopathy (76). Histopathologic characteristics of this entity include focal glomerulosclerosis with marked wrinkling and retraction of the glomerular basement membranes. Podocytes exhibit diffuse loss of their highly differentiated cytoarchitecture, including foot process effacement over 84% (range 60 to 100%) of the glomerular capillary area (73). Proximal tubule damage is also seen, and several cases of bisphosphonate-induced acute tubular necrosis have been reported (77–79). Collapsing glomerulopathy has not been reported in association with bisphosphonates other than pamidronate, however. These studies highlight important renal toxicities for this useful drug class. Although long-term prospective studies examining nephrotoxicity are lacking, current information suggests that nephrotoxicity among patients who receive bisphosphonates, particularly pamidronate, can probably be reduced by simple measures. These include careful monitoring for development of proteinuria, avoiding higher doses than the recommended 90 mg/mo intravenously, reduced dosing in renal insufficiency, and halting therapy should proteinuria or renal failure develop. A complete list of chemotherapeutic agents with known nephrotoxicity is lengthy and beyond the scope of this review. Important examples include methotrexate, which at high doses may cause obstruction secondary to intratubular precipitation, and cisplatin, which causes proximal tubule damage. A variety of chemotherapy drugs such as cisplatin and ifosfamide also cause renal electrolyte and water-handling disorders. The reader is directed to a recent review of chemotherapy-related renal disease for a comprehensive discussion (80). The general purpose of HCT is to allow administration of otherwise lethal (and hopefully curative) doses of chemoradiotherapy followed by engraftment of stem or progenitor cells for marrow recovery. Roughly 50,000 adult HCT are performed annually worldwide (Figure 2) (81). There are more HCT performed than renal transplants in the United States: 17,700 HCT compared with 14,779 renal transplants in 2002 (United Network for Organ Sharing). The mean age of HCT recipients is steadily increasing (81). Annual numbers of blood and marrow transplants worldwide, 1970 to 2002. The recent plateau in autotransplants reflects a decrease in the number performed for breast cancer. The plateau in the number of allotransplants reflects a decrease in the number performed for chronic myelogenous leukemia. Adapted from reference 81 with permission. Stem and progenitor cells may be harvested from bone marrow, peripheral blood, or umbilical cord blood. Conventional myeloablative (allogeneic and autologous) HCT use intensive conditioning regimens that consist of high-dose chemotherapy and radiotherapy to ablate disease and bone marrow, followed by reconstitution of the hematopoietic system via infusion and engraftment of stem cells. In autologous HCT, the patient’s own stem cells support recovery from chemoradiotherapy, whereas in allogeneic HCT, the stem cells are nonself. The toxicities of myeloablative conditioning exclude older and sicker patients. Thus, nonmyeloablative conditioning regimens have recently been developed to allow allogeneic HCT in such patients. These so-called “mini-allo” transplants involve less toxic conditioning because eradication of disease is mediated by allogeneic immunologic mechanisms—the “graft versus tumor” effect. The incidence and causes of ARF have been most thoroughly examined after myeloablative allogeneic HCT. Zager et al. (82) originally reported that 53% of patients developed ARF (defined as ≥50% reduction in GFR) after allogeneic HCT, with half of these patients requiring dialysis. More recent studies have confirmed these results, with a 21 to 33% incidence of ARF requiring dialysis and an associated mortality of >80% (83,84). Table 2 summarizes the published rates of ARF and mortality. The incidence of ARF after autologous HCT is lower than after allogeneic HCT. Merouani et al. (85) examined 232 patients who had breast cancer and underwent autologous HCT and found a 21% rate of moderate to severe ARF associated with a mortality rate of 18.4%. Because graft versus host disease does not occur in autologous HCT, immunosuppressive agents (which can be nephrotoxic) are not required—the absence of both graft versus host disease and drugs such as calcineurin inhibitors probably explains in part the lower rate of ARF in autologous HCT. Fewer studies have assessed renal outcomes after nonmyeloablative allogeneic HCT. A recent study by Parikh et al. (86) reported the incidence and causes of ARF in this setting. These authors found lower rates of ARF compared with myeloablative HCT. The cumulative incidence of ARF (defined as doubling of serum creatinine [Scr] at 4 mo) was still high at 40.4%, but only 4.4% of all patients required dialysis (86). Other differences in renal outcomes in myeloablative compared with nonmyeloablative HCT were noted. Most cases of ARF were related to calcineurin inhibitors and resolved with lowering of doses. In contrast to myeloablative HCT, veno-occlusive disease (VOD) was not a major cause of ARF. Finally, the timing of ARF in nonmyeloablative HCT was distributed over the first 3 mo after HCT, whereas in myeloablative HCT, ARF occurs primarily in the first 3 wk. Most of these differences can be attributed to the milder conditioning regimen used in nonmyeloablative HCT. The cause of HCT-associated ARF can be categorized according to the time period after transplantation (Table 3) (87,88). In the first days after the transplant, patients are at risk for tumor lysis syndrome and marrow infusion toxicity. Tumor lysis prophylaxis has made this a rare complication of chemoradiotherapeutic conditioning. Marrow infusion toxicity may occur in autologous HCT and is probably mediated by DMSO, a cryopreservative used in the storage of autologous stem cells. DMSO induces hemolysis of contaminating red blood cells during stem cell storage and may also induce in vivo hemolysis and ultimately pigment nephropathy (89,90). Advances in cryopreservation have made this complication rare also (91). Within the first few weeks of myeloablative HCT, recipients are at high risk for many forms of ARF (88). These include a prerenal state induced by vomiting and diarrhea, usually as a result of conditioning regimens or acute graft versus host disease, or calcineurin inhibitors. Exposure to a variety of nephrotoxic agents, including amphotericin B, aminoglycosides, intravenous contrast, and calcineurin inhibitors, may predispose to the development of acute tubular necrosis. Thrombocytopenia and neutropenia predispose to hemorrhagic or septic shock, respectively, and may also lead to acute tubular necrosis. Obstructive uropathy is rarer but can develop in the setting of severe hemorrhagic cystitis (itself the result of cyclophosphamide, adenovirus, or BK/polyoma virus infection) or of fungal infection in the collecting system. Despite the wide variety of possible renal complications in the early posttransplantation period, the most common cause of severe ARF after myeloablative HCT is hepatorenal syndrome. More than 90% of hepatorenal syndrome cases are due to VOD, with rare cases from acute hepatic graft versus host disease or viral or drug-related hepatitis (82). The incidence of VOD varies according to the diagnostic criteria used but ranges between 5 and 70% in different reports (92). VOD is considered a conditioning-related toxicity and is associated most commonly with regimens that include cyclophosphamide, busulfan, and/or total body irradiation (93). Other risk factors for the development of VOD include older age, female gender, advanced malignancy, previous abdominal radiation, amphotericin B exposure, and vancomycin or acyclovir therapy (the last three presumably markers of infection) (94). Clinical features of VOD include weight gain, painful hepatomegaly, and jaundice. Diagnosis is complicated by the variety of conditions that mimic VOD, such as acute hepatic graft versus host disease, sepsis or drug-induced cholestasis, calcineurin inhibitor toxicity, gall bladder disease, and use of total parenteral nutrition (94). Timing of symptom onset aids in diagnosis: VOD generally appears during the first 30 d after HCT. In the early stages of the syndrome, sodium retention predominates with consequent weight gain, edema, and ascites. Jaundice and right upper quadrant pain follow. ARF then often arises and may be precipitated by renal insults such as sepsis or nephrotoxins. Roughly 50% of those with VOD develop ARF, but some degree of renal insufficiency exists in every patient (83,95). Severity of disease varies. In mild cases, hepatic injury is self-limited with complete resolution of symptoms and signs. In moderate disease, diuresis or analgesia for right upper quadrant pain may be required, but the syndrome eventually resolves completely. Severe VOD consists of progressive hepatic failure accompanied by renal failure and carries a mortality approaching 100% by day 100 after HCT (96). The clinical features of VOD-associated renal failure are very similar to those seen in hepatorenal syndrome. Many patients are oliguric with low urine sodium concentration. Severe sodium and water overload are common. Patients generally have low BP and hyponatremia. Although VOD is characterized histologically by hepatic microangiopathy, no such lesion in the kidney is identified at autopsy (97), in keeping with the notion that the renal injury in hepatorenal syndrome is hemodynamic rather than structural. A central role for endothelial damage has been hypothesized to initiate VOD, and so the coagulation cascade may be a point of intervention in this disease. Previous trials investigating antithrombotic and thrombolytic agents have been disappointing, but promising results from recent controlled trials have been reported with defibrotide, a single-stranded polydeoxyribonucleotide (98,99). This agent binds vascular endothelium and has fibrinolytic, antithrombotic, and anti-ischemic properties. Prospective trials are under way to confirm its efficacy in the prophylaxis and treatment of VOD. Evaluation of the patient should be as for any patient with hospital-acquired ARF but with particular focus on the contribution—if any—of hepatorenal syndrome to the clinical picture. Where possible, further exposure to nephrotoxic drugs should be minimized: If calcineurin inhibitor trough concentrations are high, then reduction in dose should be considered; alternatives to amphotericin are now available (100). No randomized controlled trials have compared intermittent hemodialysis with continuous therapies in the setting of severe ARF after HCT. Whatever the modality used, it should be noted that the prognosis in those who develop severe liver and renal failure is very poor. Continuous therapies do offer at least two potential advantages: (1) in the setting of hepatorenal syndrome, there is some evidence that they are associated with less increase in intracranial pressure (101); (2) the daily obligate fluid intake in these patients is frequently massive and is most easily controlled by a continuous method. Vascular access can be problematic because of thrombocytopenia and neutropenia predisposing to bleeding and infection, respectively. Chronic kidney disease (CKD) is an important long-term complication of HCT, particularly allogeneic HCT (developing in 15 to 20% of survivors of the latter) (88). Given the number of allogeneic transplants performed yearly (Figure 1), the overall burden of CKD in survivors of allogeneic HCT represents a significant future public health problem (102). The majority of cases of CKD after HCT are thought to be related to a low-grade renal thrombotic microangiopathy (102). Characteristic clinical features are slowly rising plasma creatinine, hypertension, and disproportionate anemia. Some cases have a more fulminant presentation, however. Urine dipstick shows variable proteinuria and hematuria. Careful review of previous laboratory tests will often show evidence of a (low-grade) thrombotic microangiopathy: Intermittent or persistent elevation in plasma lactate dehydrogenase, low serum haptoglobin, low platelets, and low hemoglobin and sometimes schistocytosis. Renal imaging is usually unremarkable. In our opinion, kidney biopsy is very rarely required—unless the presentation is very atypical—as the laboratory features are often suggestive (although not diagnostic), biopsy findings are unlikely to significantly alter management, and biopsy carries increased risks in these patients with thrombocytopenia and other morbidities. Typical histology includes mesangiolysis, basement membrane duplication, glomerular endothelial cell swelling, and tubular injury with interstitial fibrosis (103). Certainly, other forms of glomerular disease, such as membranous nephropathy, have been described after HCT, but these are relatively rare. Thrombotic microangiopathy after HCT is probably multifactorial in cause. Current thinking regarding causes is summarized in Figure 3. The conditioning regimen—particularly the irradiation—is thought to be the primary cause of renal endothelial damage, with post-HCT factors such as graft versus host disease, infections, and medications (e.g., the calcineurin inhibitors) playing a later modulatory role (104). Tubular damage and interstitial fibrosis are seen in animal models of radiation nephropathy, and whether these changes are secondary to the glomerular damage or the direct result of irradiation remains unresolved (105). Note that the time course for development of renal failure (often many months after HCT) is typical of radiation-induced kidney damage: Kidney cells have much slower turnover than mucosal cells and thus manifest radiation damage much later (106). Simplified schema of putative thrombotic microangiopathy (TMA) pathogenesis after hematopoietic cell transplant (HCT). Renal irradiation, as part of pre-HCT conditioning, damages renal microvasculature. Factors that affect progression are not well defined but may include concurrent chemotherapy, genetic factors, use of calcineurin inhibitors, presence of graft versus host disease or procoagulant state, and infection. Damage to the endothelial cell causes loss of thromboresistance with fibrin deposition, swelling, and microvascular obstruction causing microangiopathic hemolysis. Resultant glomerular ischemia may cause hypertension and over time lead to fibrosis and renal failure. Risk factors for development of TMA syndromes after HCT are not well defined and certainly require further study. Dose of radiotherapy and use of concurrent cytotoxic chemotherapy are thought to be important (107); conversely, renal shielding during total body irradiation is somewhat protective (108,109). Calcineurin inhibitors do not worsen radiation nephropathy in an animal model, but their role in humans is unclear (110). Our group has reported that sirolimus-when added to calcineurin inhibitor therapy-may be associated with a higher incidence of TMA, but, fortunately, this is often reversible (111). A recent study that examined angiotensin-converting enzyme genotype in HCT-associated renal failure suggested that genotype influences renal injury, but the result was of borderline significance (109). The management of TMA after HCT is discussed below. It is important to note that moderate to severe graft versus host disease carries a mortality of 10 to 50% (112). When used with glucocorticoids, cyclosporine or tacrolimus reduces the incidence of both acute and chronic graft versus host disease after allogeneic HCT. Furthermore, these drugs do not suppress the bone marrow. Long-term use of these calcineurin inhibitors after HCT very likely contributes to CKD, as has been well described in nonrenal solid organ transplantation and autoimmune disease (113). Fortunately, calcineurin inhibitors are discontinued in the majority of HCT recipients after 4 to 12 mo (114). Thus, the contribution of this drug class to CKD is probably modest in many HCT patients. It is likely that in some, cases calcineurin inhibitors exacerbate the TMA, which can arise after HCT (calcineurin inhibitor-induced TMA has been well described after kidney transplantation, for example [115,116], but this is difficult to assess). Careful review of the patient’s pre- and post-HCT history is essential. Attention should be paid to the following: Type of HCT and type of conditioning regimen (in particular, whether total body irradiation was used and at what dose) and degree of exposure to nephrotoxins (e.g., prolonged treatment with amphotericin). The examination frequently shows hypertension, hypervolemia, and skin graft versus host disease. Blood tests should be reviewed carefully and repeated to assess for TMA—it should be noted that laboratory features are often intermittent and not florid. As discussed above, we believe that kidney biopsy is rarely indicated. Renal ultrasound is often used to exclude postrenal causes, but other imaging studies are rarely required. General treatment—including control of hypertension—should be as recommended for any CKD patient (117). Anemia and hyperkalemia may be more common than in patients with other forms of CKD and require more aggressive treatment (88). 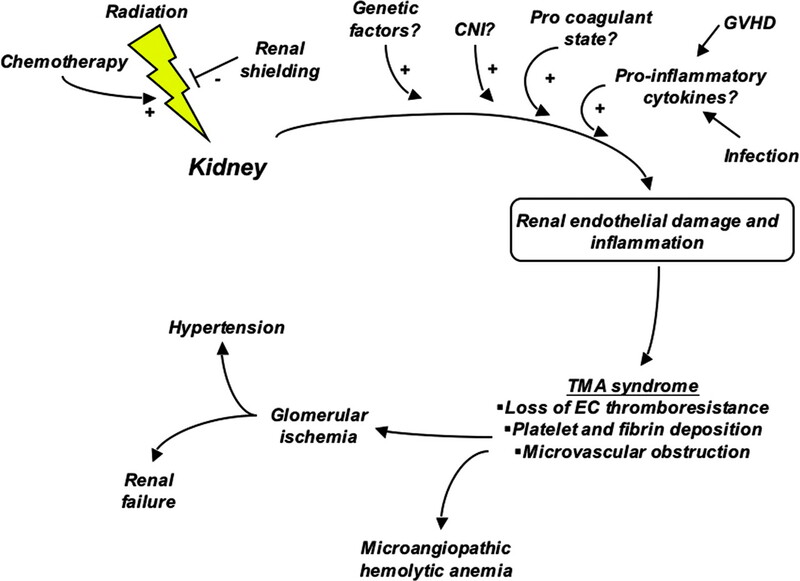 Angiotensin-converting enzyme or angiotensin receptor blockade retards progression in animal models of radiation nephropathy and is recommended for this and for the usual CKD indications (106). Although hyperkalemia may be problematic, our preference is to try to continue this strategy, using a low-potassium diet, diuretics, and low-dose sodium polystyrene, if tolerated (118). In the absence of data, it seems worthwhile to minimize calcineurin inhibitor dosage—if possible—as is sometimes done in solid organ transplantation (113). Although plasma exchange is sometimes used in florid forms of TMA after HCT, there is no evidence to date of benefit (119). A subset of patients will progress to ESRD, and, overall, these patients may have worse survival on hemodialysis than patients with ESRD from other causes (120). Suitability for renal transplantation must be judged on a case-by-case basis. It is interesting that those who receive a renal allograft from the same donor as their original HCT will need minimal or no immunosuppression as a result of immunologic tolerance of the allograft (121). Renal failure remains an important complication of cancer and its treatment. The spectrum of cancer-associated renal disease has changed in the past 20 years, in large part as a result of the use of newer chemoradiotherapy regimens. Nevertheless, a simple and systematic approach to assess and treat potential prerenal, intrarenal, and postrenal causes is indicated in all patients. Early diagnosis and treatment of renal failure is vital—both to improve renal outcomes and to ensure that patients are best prepared for further oncologic treatment. Close cooperation with oncology colleagues is essential to improve outcomes in these complex patients. B.D.H. is supported by National Institutes of Health Grant F32 DK069037-01.